Mark this on your calendar: On May 1st, the Peterborough Downtown Farmers’ Market will open for the 2019 season. Charlotte Street will be closed to vehicle traffic between Louis Street and George Street as the area is transformed into a pedestrian friendly, bustling Farmers’ Market, every Wednesday between 8:30 a.m. and 2:00 p.m., until October 30th. This year marks the 22nd year of bringing fresh locally grown seasonal produce and products to Downtown Peterborough. As a proud producers-only market, shoppers can be sure they are buying direct from the farmers, growers, bakers and chefs themselves, and learn about diverse local produce as it comes into season. Each Wednesday, market-goers will find a festive and lively market full of their favourite vendors selling seasonal produce, meats, cheese, fresh flowers, baked goods, art, plants to grow, coffee and lunches to go. To learn more about the market, visit their website here. You can also find them on Facebook. Muddy’s Pit BBQ (3247 County Rd. 2 in Keene), which has become a go-to destination point—one of those places to check off your bucket list over and over again—is now open for the season. Muddy’s authentically barbeque all of their meat on custom outdoor smokers (designed and built by Sloan Custom Smokers) using only log hardwood. -> A Lunker: a hot link on a bun, with pulled pork and baked beans smothered on top. Muddy’s do not take call-ahead orders for pick up or take reservations, nor do they offer delivery. Catering options are available for groups of 20+. On Episode 33 of PTBOCanada, we sit down with Entomo Farms Co-Founder Darren Goldin to talk about how his insect—yes insect—farm in Norwood, Ontario near Peterborough has become a global leader in the cultivation of cricket powder and insect protein, and how it might play a huge part in the future of food consumption and the sustainability of our planet. Entomo Farms has emerged as one of the largest cricket farms in the world, and produces insect protein as a viable and altruistic response to the global crises (food, water, natural resources) that is imminently upon us. The cool Peterborough-based health food startup Chimp Treats will have its frozen fruit product “Nicecream” hit a wave of Loblaws locations across Ontario starting on September 5th. Nicecream will hit shelves across select Loblaws stores including the GTA, Ottawa, London and Barrie, and the next wave of locations will be in Québec in Loblaws’ Provigo Le Marché stores. After that, Chimp Treats aims to continue adding new locations until they reach all Loblaws stores across Canada by May 2019. The team behind Chimp Treats: (left to right) Whitney, Brooke and Jillian. The announcement is the latest for a company that has had huge momentum since launching just one year ago on the market. They are one of the fastest growing natural food brands in Canada. Founder and CEO, Brooke Hammer, 23, launched Nicecream in 2017 and has since expanded coast-to-coast with niche retailers such as Whole Foods Market and Healthy Planet. While attending Trent University in Peterborough, Hammer developed an innovative manufacturing process that allowed her to create the fruit-only frozen dessert on a large-scale, commercial basis. Since entering the market, the entrepreneur has continued to reach new stores and locations along with growing her team. The 16th Annual Ribfest runs Friday, July 13th to Sunday, July 15th at Millennium Park, and admission is free. -> Friday, July 13: 11 a.m. to 10:30 p.m.
-> Saturday, July 14: 11 a.m. to 10:30 p.m.
-> Sunday, July 15: 12 p.m. to 5 p.m. Taste of Downtown returns to Charlotte Street on Saturday, June 2nd from 11 a.m. to 5 p.m. This is a great opportunity to enjoy delicious cuisine from more than 28 local restaurants, enjoy a beverage in the beer and wine garden hosted by The Venue and Publican House, and take in some amazing live entertainment. There will be also be aerial entertainment from the Peterborough Academy of Circus Arts, pop-up live art demonstrations from the Art School of Peterborough, a free Calico Critters-themed play area, face painting and a bouncy castle. There will be great deals to be had as the businesses along Charlotte Street put on a giant sidewalk sale. For more info on all the events happening this Spring/Summer in the downtown, click here. If you love Southern-style food like pulled pork, brisket and ribs, you must try Muddy's Pit BBQ in Keene near Peterborough. 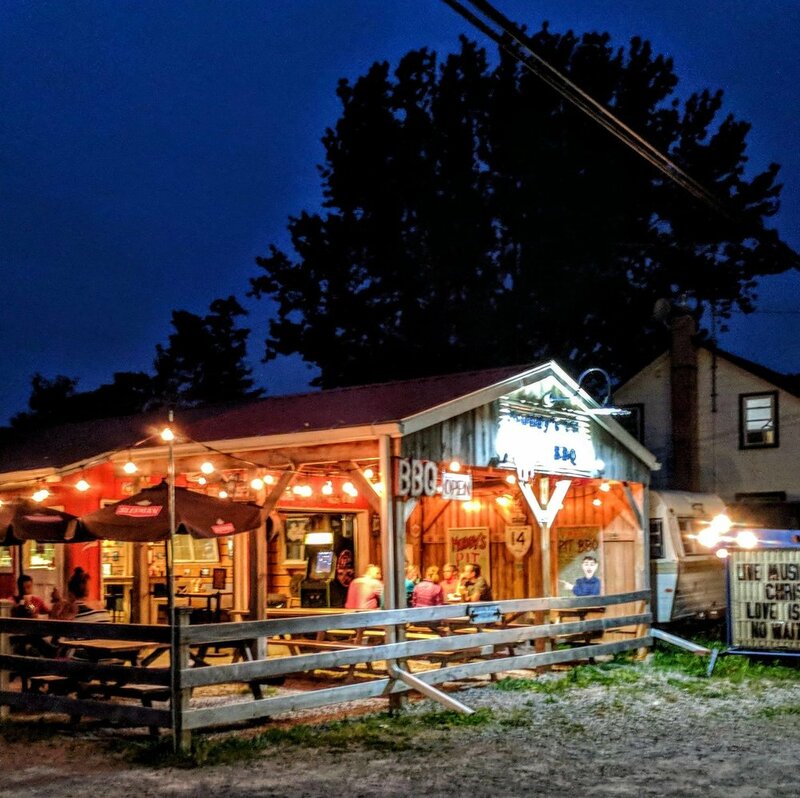 It's so delicious that a Search and Rescue Team out of Canadian Forces Base Trenton landed in a farmer's field shortly after Muddy's opened last season so they could grab food there. Muddy's, which is located at 3247 County Rd. 2, has fired up the cookers for the 2018 season—it's 9th season in business—and open on April 4th. And yes, it's worth the drive to beautiful Keene. The Nourish Project—a local food-based collaborative that is part of a broader movement that seeks to give food more importance in our communities, our economy, and our everyday lives—has recently launched a neat Community Cookbook project. Since food can be an important and vital part of feeling a sense of belonging and connecting as a community, Nourish Project is asking Peterborough (and County) residents to submit a recipe that signifies belonging, such as a family recipe or a potluck favourite. As an example, Nourish Project posted here about the inspiration for one submitted recipe, "Italia's Petelli", that they sampled. If you're interested in submitting a recipe to this cookbook project, you can submit to this online form or do so by email here. They ask that you include photos of either the final recipe, ingredients or and/or preparation. Nourish Project will reach out to you (by phone, in person or email) about your submitted recipe and what belonging and your passion for food means to you. They will then create a "story" to attach to the recipe.